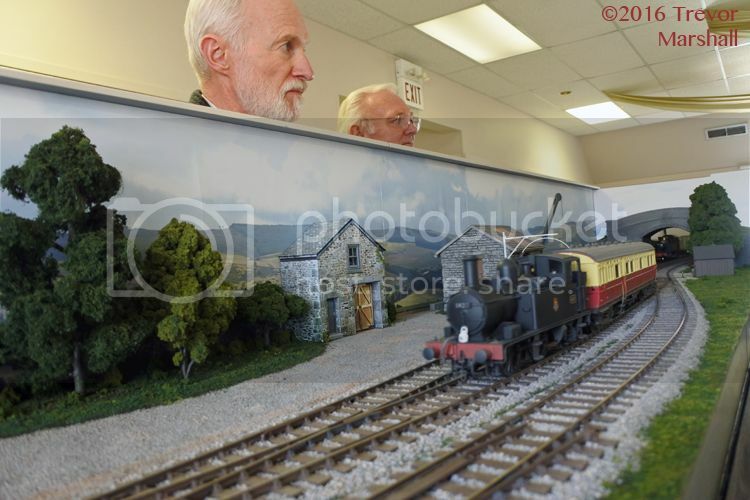 Yesterday, my friend Brian Dickey displayed his British 7mm scale exhibition layout, Roweham, at an area train show – and he asked Pierre Oliver and me if we would like to help him out. We both jumped at the chance – and we’re really glad we did. 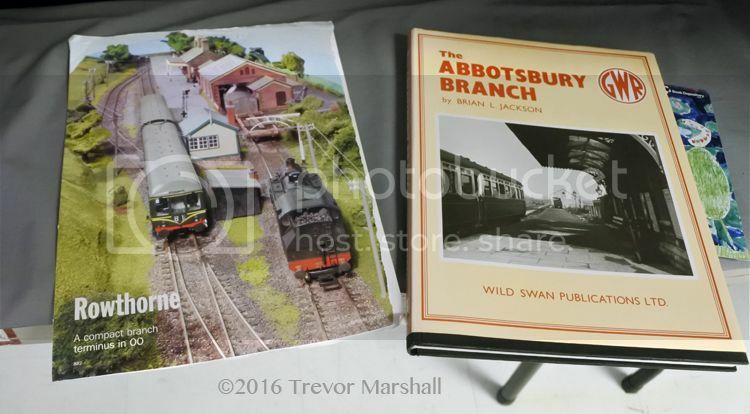 This was my first opportunity to operate on a 7mm British layout, although I have seen many in print and a few at shows. Brian has done a spectacular job, as I hope the point-and-shoot photos I’m sharing here convey. And he’s done all of this in just two years. I’d never used them, but they were surprisingly easy to master. Brian has made up coupling/uncoupling tools similar to my Galvanick Lucipher, with a fine brass hook instead of a magnet at the business end of the tool. – There are never any false couplings – e.g. : uncoupling then moving the train in the wrong direction and recoupling. – There are never any false couplings – e.g. : thinking you’ve mated couplers, but when you pull away, the couplers separate. This isn’t usually a problem with Kadees but it’s definitely an issue with Sergents. 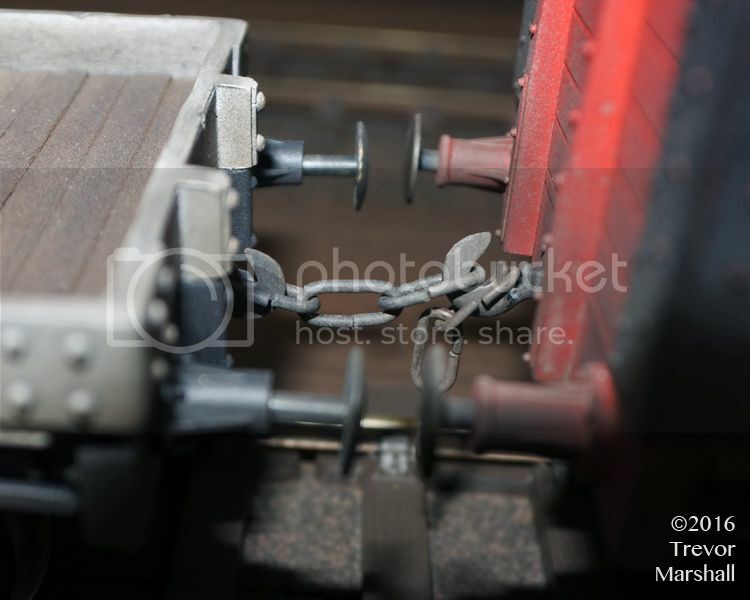 – Delayed uncoupling to shove a wagon into a spot is a snap. It’s the default condition. – All places where one must couple or uncouple must be easy to see and to reach. Carefully consider structure and tree placement and how they would affect this. Brian’s layout is at an ideal height for working with three-link chains, while the 19″ depth meant we were always able to look down on the job – not try to do it from the side. – You can neither couple nor uncouple while laughing. So cut that out. The locomotives are beautiful. 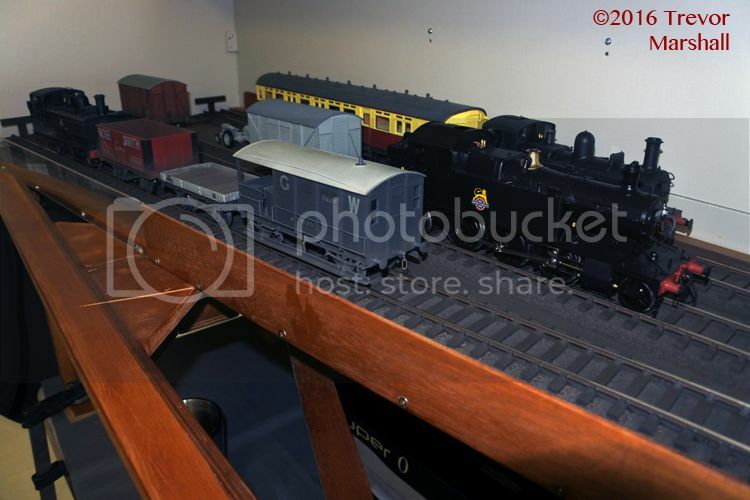 We operated with a GWR pannier tank engine from Lionheart Trains on the goods train, and a lovely 0-4-2T from Masterpiece Models, hauling a Loinheart Autotrailer. Both locomotives were factory-fitted with DCC and sound. The 0-4-2T’s decoder even provided appropriate Autotrailer sounds, including guard’s whistle, carriage doors slamming shut, and the warning gong. The control over the locomotives was astonishing. Never mind the lack of need to thump the table: When Pierre and I were shunting wagons, we could ask the engine driver to give us slack in the chain – and the engine driver could back up so slowly and precisely that one could provide slack without hitting the buffers on the wagon. Basically, one could creep back half a link at a time. 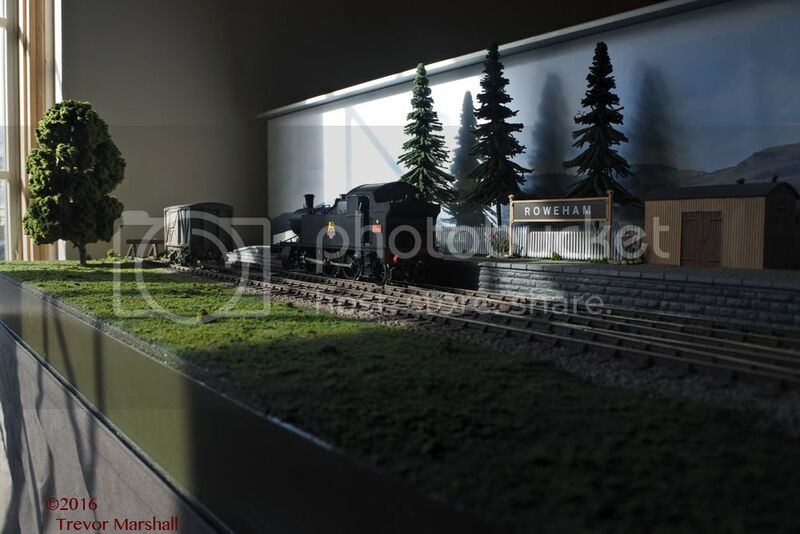 7mm British modelling is an ideal size for an exhibition layout. The models are big enough that they have real presence at a show. At the same time, they’re small enough that a nice exhibition layout can be built without requiring a gymnasium to set it up. 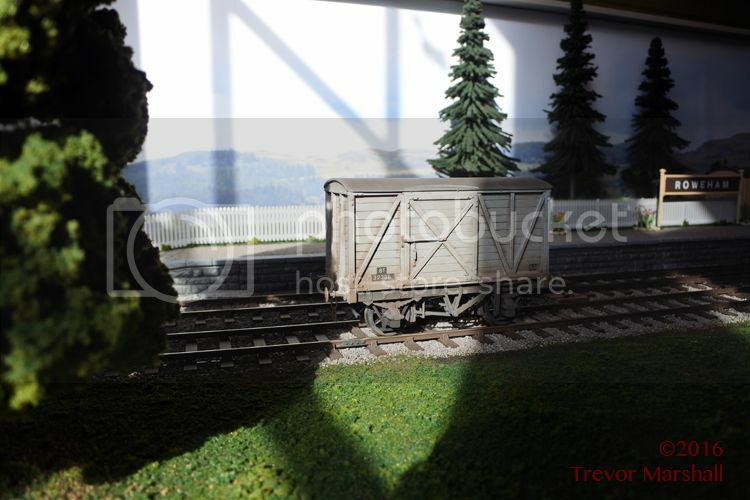 With the exception of the Autotrailer, which was quite long, all the equipment on the layout compared in length to what one would find on an HO layout that ran 50-foot freight cars. Presentation is important. While those in the UK may be used to layouts that exhibit some thoughtful and professional presentation, I find this is rare in North America. 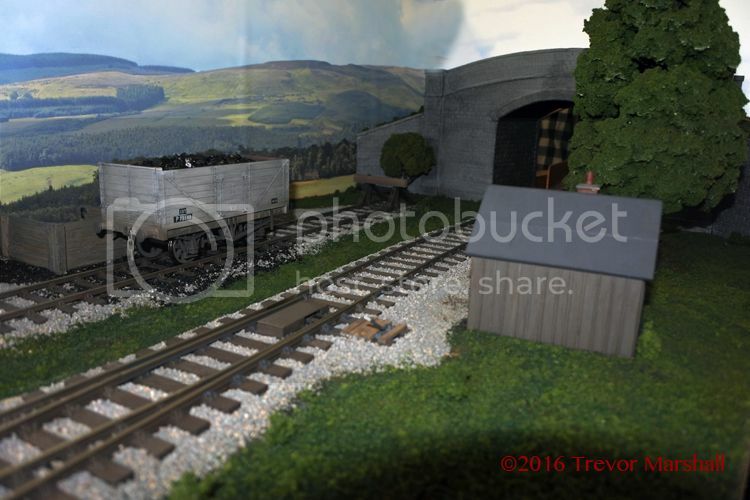 Brian has done a wonderful job of finishing the layout. The benchwork is nicely painted. There’s a drape to hide the legs (and the DCC system, and a camera or two, and lunch, and…) – plus another drape to hide the venue’s banquet tables. There are some nice signs to tell punters what they’re looking at, and so on. 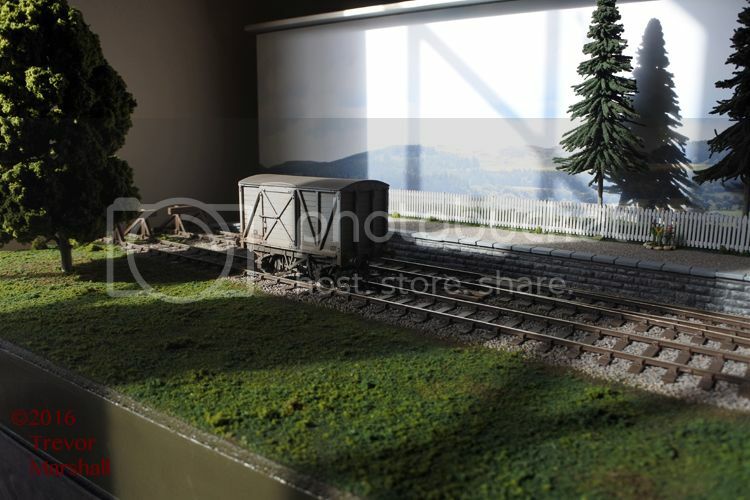 – Back: Exhibition layouts are like a theatre stage, with the trains as the actors. The people who bring the theatre to life – the director, the stage manager, etc. – are backstage, in the wings, so they don’t take away from the performance. – Front: Exhibition layouts are like a TV talk show shot in front of a live audience. 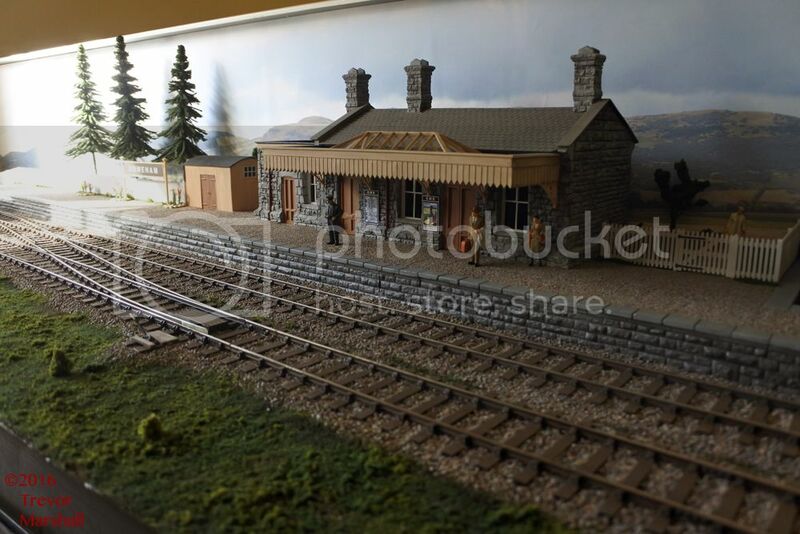 The trains are the guests, the layout is the stage – and the presenter is out front, where she/he can engage with the audience. – Back: I don’t agree with you. – Front: I don’t agree with you. – Back and Front: Let’s grab a pint. That said, I enjoyed working from behind the scenes – although I also made a point of talking over the backdrop with the punters. 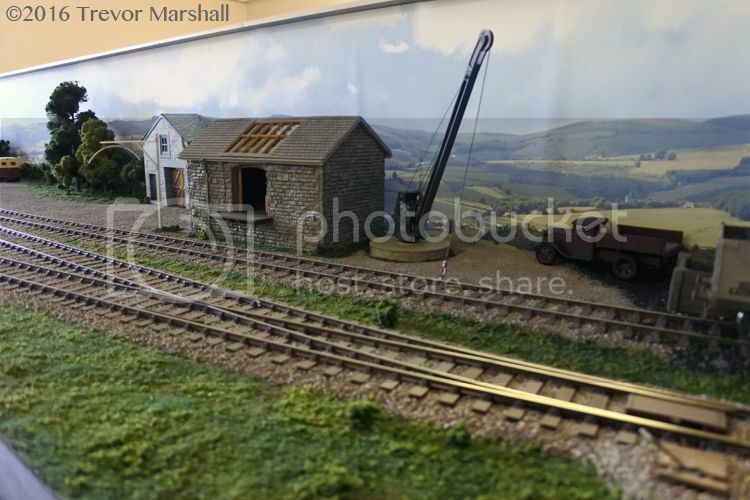 The narrowness of this layout – just 19 inches – definitely helped in that regard. From a practical perspective, the sturdy backdrop was important, given that we had to reach into the layout frequently to couple and uncouple. It protected structures and trees from our elbows and gave us a place to steady our arms so we could hook a link. – What sort of paperwork is used to move wagons? 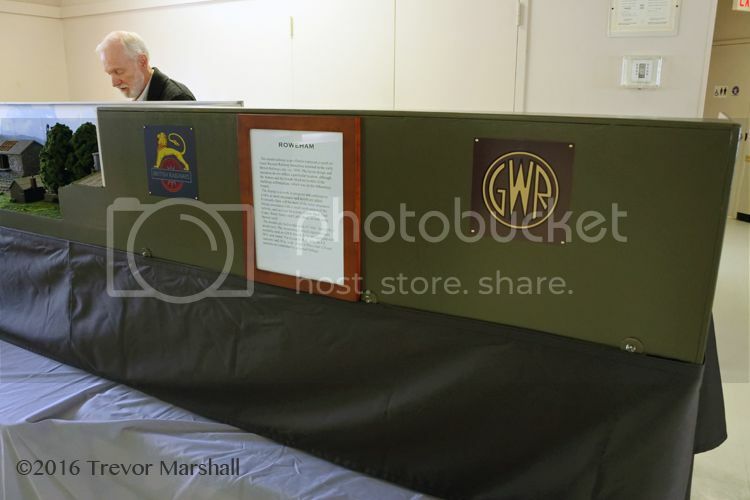 Did the GWR have waybills, and what did they look like? – When and how was the locomotive whistle used? (UK locomotives, in general, do not have bells.) If I recall, a “long-short” is used when emerging from tunnels, under bridges, or other sight-limited situations. 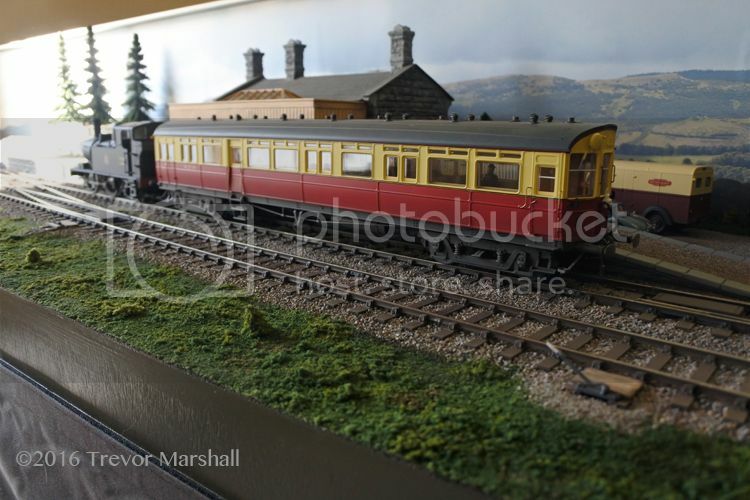 But the 0-4-2T had two whistles – a high-pitched one (with long and short function buttons) plus a lower pitched “warning whistle” (with long and short function buttons). When would I use each of these? – When was the Autotrailer’s “Warning Gong” used? – What language was used between engine driver and the guy on the ground (what we’d call a brakeman here) to communicate shunting moves? Is he a brakeman in the UK? 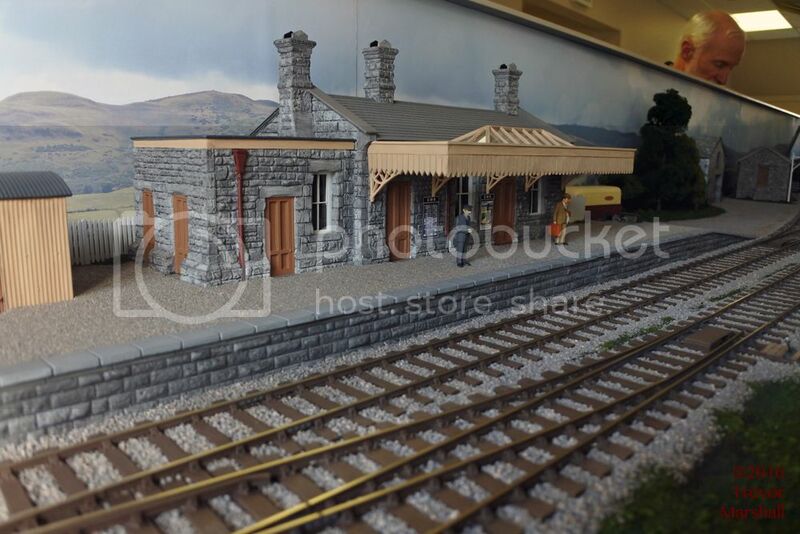 I’d love to find out more about GWR operating practices to help bring Brian’s layout to life at shows. 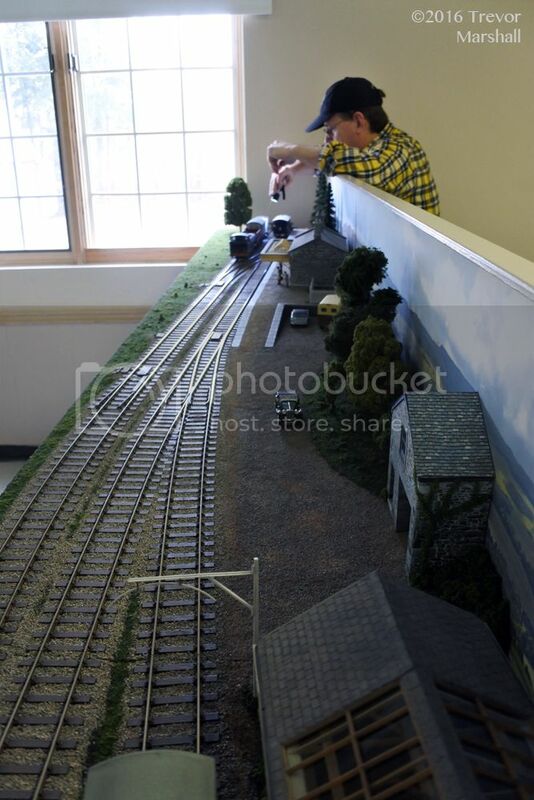 I would love to see more quality layouts like this at exhibitions, as opposed to layouts that emphasize quantity. A huge, poorly-conceived and poorly-executed layout leaves me cold, but smaller, well-done layouts like this are a delight – regardless of theme, scale, or prototype. 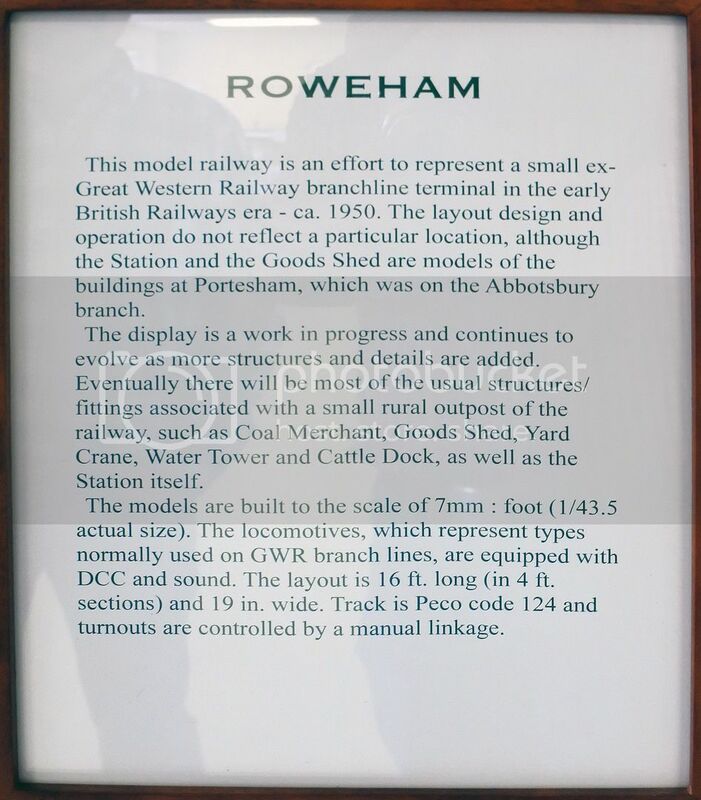 Thanks, Brian and Pierre, for a terrific day out in GWR country: I look forward to future opportunities to run trains to Roweham!